Obama Picks San Antonio Mayor For Convention Keynote : It's All Politics Julian Castro, the high-achieving and young mayor of San Antonio, will become the first Hispanic American to give the keynote address at a Democratic convention. In what now looks like practice for the big show to come, San Antonio Mayor Julian Castro gives the keynote address at the Texas Democratic Convention in Houston on June 8. Get used to hearing the name Julian Castro. You're likely to be coming across it a lot in coming days and perhaps beyond. President Obama chose Castro, the 37-year-old mayor of San Antonio, to be the keynote speaker at the Democratic National Convention in Charlotte, N.C., in September. The spot of keynote speaker at Democratic conventions typically goes to rising stars in the party, with an emphasis during the last few conventions on youth. Indeed, it was his star turn as keynoter at the 2004 Democratic National Convention that helped make Obama a political superstar. Castro certainly fits the bill of rising star. And he's certainly ambitious, as apparent in interviews with NPR's Neal Conan on Talk of the Nation and WGBH's One on One with Maria Hinojosa. 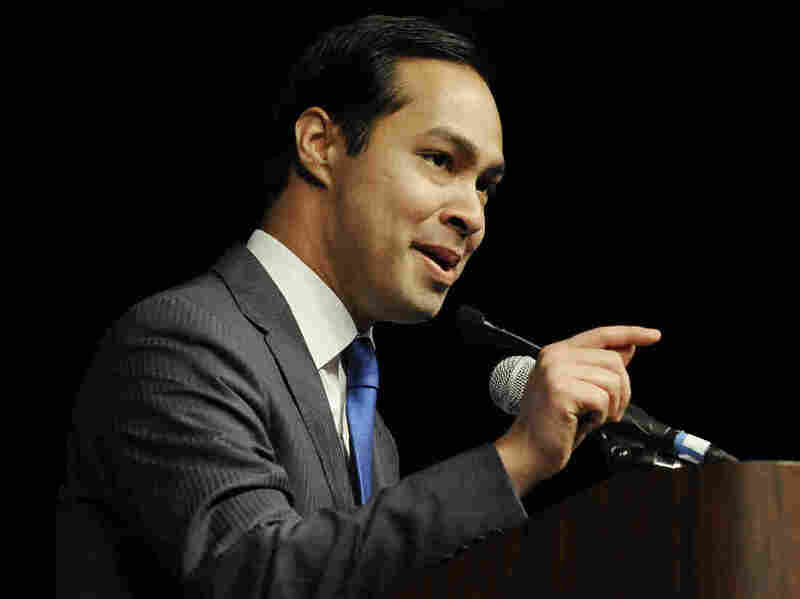 A graduate of Stanford University and Harvard Law School (like his twin brother, Joaquin, a Texas state representative), Castro became the youngest mayor of a top 50 U.S. city in 2009. That, among other achievements, long ago put Castro on the radar of some of the keenest political observers as a local politician with national potential.
" 'Julian Castro has a very good chance of becoming the first Hispanic president of the United States.' he says flatly." Judging by the Times profile there's probably much to support McKinnon's statement. It appears he has as much of a chance to be the first Hispanic president as anyone. Like Obama, Castro was raised by an idealistic single mother concerned with social justice. In Castro's case, his mother was a leading activist with La Raza Unida, a 1970s political movement aimed at increasing Chicano political power in the Southwest. One of the most fascinating tidbits from the profile was that Castro didn't learn to speak Spanish at home and in the neighborhood, like many other Latino politicians, who use their fluency in the language to connect with Spanish speakers. "A Mexican-American with statewide political aspirations needs to be able to do more than pronounce his name correctly. Early in his administration, Castro assigned his chief of staff, Robbie Greenblum — a Jewish lawyer from the border town of Laredo whose own Spanish is impeccable — to discreetly find him a tutor. Rosie Castro's son is now being taught Spanish by a woman named Marta Bronstein. Greenblum met her in shul." The choice of Castro can be viewed as Obama's way of showing Latino voters that he values them and underscores how important their votes are to him. The president enjoys a huge advantage over Mitt Romney in terms of Latino support, as indicated by polling. But the question has been how much of that support will translate into people actually going to the polls on Election Day. Democrats have worried that because it's unlikely they'll match the excitement of 2008, some of that much-needed Latino support may just stay home come Nov. 6. Such concerns mean Obama needs to find ways to excite his political base, particularly Hispanics whose support could mean the difference between victory and defeat in battleground states like Florida, Nevada and Colorado. The president's recent move to use executive action to put into effect some of the goals of the stalled DREAM Act legislation, including stopping deportations of certain young illegal immigrants while allowing them to work legally or attend school in the U.S., could translate into more Hispanic votes for the president. The selection of an attractive, brainy politician like Castro for the keynote speech could also help the president generate more excitement among Latino voters.